Red blood cells, known also as RBCs, have several important roles to play in our bodies. The primary function of red blood cells is to carry oxygen from the lungs to the tissues around your body. As a secondary function, they are also a key player in getting waste carbon dioxide from your tissues to your lungs, where it can be breathed out. When red blood cells stop functioning properly, you can rest assured that many things are going to go wrong in your body. In order to properly understand the function of a red blood cell, you have to understand something about the structure. A typical RBC is about 6-8 micrometers in diameter, about the same as the width of a spider web strand. An RBC is biconcave in shape. Think of it like a miniature donut, only the hole in the center doesn’t poke all the way through. This small shape and physical structure allows the RBC to squish in to the small capillaries where your blood vessels are the smallest. Without this ability to flex, they would easily get stuck and cause obstructions in your circulation. 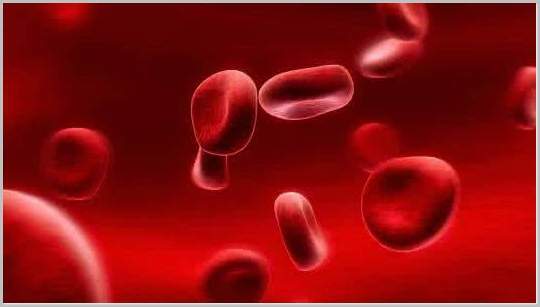 The oxygen carried in your red blood cells is stored in a special protein known as hemoglobin. There are several different types of hemoglobin and the exact structure of this important protein is quite complicated, so this explanation will be something of a gross oversimplification. A single hemoglobin molecule is made of four identical sub-units. Each sub-unit has a heme component, aglobin chain and an iron atom bound to the heme section. Red blood cells are completely lacking in most other common cellular parts, such as a nucleus with DNA, or mitochondria. Oxygen is able to bind to each of the iron atoms, meaning that a single hemoglobin molecule is able to carry up to four oxygen molecules at its maximum capacity. Interestingly, the structure of hemoglobin makes it such that the more oxygen that is bound to one of the sub-units, the more other oxygen molecules are attracted to the remaining iron atoms. Again, the details of this effect involve a lot of complex chemistry, but this effect it important to the proper functioning of a red blood cell in oxygen transport. The ability of oxygen to bind to hemoglobin is effected by many factors. The acidity of the blood (pH) is a primary factor, as is the temperature. Fetal blood has a different ability to bind oxygen (it holds on to the oxygen more tightly). Other chemicals such as hydrogen sulfide, carbon monoxide, hydrogen sulfide and 2,3bisphosphoglycerate (there’s a mouth-full, eh?) also effect the ability of hemoglobin to carry oxygen. Factors in binding such as pH and temperature are vital to hemoglobin function. Your red blood cells need to grab on to oxygen in the lungs and let go of it in the tissues. Subtle changes in the pH and temperature of your blood (along with some other effects) allow the hemoglobin molecules to catch and release oxygen at the proper times. A huge amount of space in a red blood cell is taken up by hemoglobin. Well over 90% of the content of an RBC that is not water, is hemoglobin. Even taking water in to account, over a third of the mass of an RBC is hemoglobin. The second important function, just as important as carrying oxygen although less commonly known, is the ability of red blood cells to carry carbon dioxide. CO2 is a waste product of metabolism in every cell in your body. You need some way of getting rid of it all the time, or you will die rather quickly. Red blood cells serve as the vehicle to rid your body of this waste. The process by which your red blood cells transport carbon dioxide is different than oxygen transport. RBCs contain an enzyme called carbonic anhydrase. As the CO2 enters the RBC, this enzyme, with the help of some water, converts it into another chemical called bicarbonate. Bicarbonate is used to control the pH in your blood and it later excreted either via your lungs or your kidneys. Some CO2 is dissolved in your blood directly and a small amount is actually carried on the hemoglobin molecules, but the vast majority is converted to bicarbonate. Because red blood cells are so important to your body, when they don’t work properly, it often leads to disease. Although there are literally dozens of diseases related to your blood, I’ll mention a couple of the more common (or at least interesting) ones. Sickle cell disease is a common disorder of the red blood cells. It is a genetic disease found mostly in persons of African descent. The disease involves a single DNA mutation that causes the cell wall of the red blood cells to not form properly. The RBCs become misshapen. Instead of round and biconcave, they become long and thin. Because of this the RBCs do not carry oxygen as efficiently and can become stuck in small capillaries, causing tremendous pain. Interestingly, the presence of these misshapen red blood cells is not entirely a bad thing. People with this genetic defect are more resistant to malarial infections, which rely on normally shaped red blood cells to infect a person. Carbon monoxide poisoning is another interesting problem related to red blood cells. Carbon monoxide (CO) is structurally very similar to oxygen, which is normally found as a pair of atoms. Hemoglobin doesn’t differentiate between CO and O2 very well. In fact, carbon monoxide is hundreds of times more attracted to hemoglobin than oxygen. This is a big problem if you inhale too much CO. The CO takes over the iron binding sites on the hemoglobin and doesn’t allow space for oxygen to hitch a ride. In essence, you end up suffocating because the oxygen you breathe in cannot be transported to the tissues in your body. As you can see, red blood cells can be quite complex. There are many issues here that I’ve covered in very shallow detail. To learn more about how RBCs work, you can always apply to medical school and become a hematologist!